1 Waterways Centre for Freshwater Management (WCFM), University of Canterbury and Lincoln University. 2 Marine Ecology Research Group (MERG), University of Canterbury. The full paper in NZ Journal of Marine and Freshwater Research is available online here. Protecting and enhancing spawning habitat is therefore a very practical activity that can assist with whitebait conservation, and tools such as spatial planning and the use of protected areas offer promising ways to address the problem. However, locating where the spawning sites are is not straightforward and this has become a barrier to practical action. The location and extent of the spawning habitat requirements in different rivers is essential information for the design of effective strategies. In a nutshell, we need to know which areas are important to protect, and whether additional protection (or restoration) would be beneficial. However, because rivermouth systems are dynamic, the location and extent of spawning sites can change over time. This introduces some complexities for ‘nailing down’ the answers that are needed to inform effective conservation strategies. To help address the above problem, we developed a survey methodology to detect all of the spawning in a catchment. Reliably capturing this information over time is very useful for identifying trends. Different forms of īnanga spawning surveys have been carried out in New Zealand for several decades and our approach was to adapt the existing methods to achieve the ‘catchment scale census’ we were after. an initial investigation to characterise the big picture and set the survey limits. This uses a different approach to existing methods which typically focus on the location of the ‘salt water wedge’. 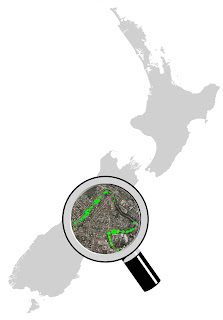 a habitat quality assessment step similar to that used in an Australian study2, but guided by set criteria. The objective of this step is to identify all areas that could potentially support spawning in the catchment. intensive searches of riparian vegetation in the areas identified via the above steps to detect spawning sites3, but using standardised time frames that are repeated over several months. The latter is important to address spatiotemporal variation that arises at several scales and can potentially confound the interpretation of ‘snapshot’ surveys. Examples of major confounding factors that we have addressed are differences in spawning activity between months, and the effect of egg mortality on the riverbank (meaning that actual spawning sites may be difficult to discover in searches that are looking for eggs). In the paper we include details of how the census survey was applied to locate spawning sites in the Heathcote/Ōpāwaho catchment after the Canterbury earthquakes. We were especially interested in whether they might have shifted location in the catchment. At the start of the study the post-quake pattern was initially unknown (similar to a river had never been surveyed) but in this case the river has been well-studied over several decades. By comparing our results with earlier īnanga spawning surveys we were able to show that the downstream limit shifted considerably following the earthquakes. Because many current riparian management activities are not compatible with protecting spawning habitat this is important information for conservation4. Other aspects such as trends in areas that are the most used or produce the most eggs could be resolved by repeat surveys. Another interesting finding was the discovery of high egg numbers at sites where reed canary grass (Phalaris arundinaceae) was the dominant vegetation. Although this invasive species has previously been regarded as a threat to spawning habitat it currently supports the majority of spawning in the Heathcote/Ōpāwaho. Together, these examples show some of the useful outcomes that may be generated by a comprehensive survey methodology to reliably quantify īnanga spawning habitat at a catchment scale. The census-survey approach is applicable to rivers nationwide and will help to address the current information gaps around where spawning occurs and what is needed to protect it. Thanks to the Ngāi Tahu Research Centre, IPENZ Rivers Group, MBIE grant C01X1002 in conjunction with NIWA, and the many volunteers that helped to support this work. 1 Hickford MJH, Schiel DR. (2011). Population sinks resulting from degraded habitats of an obligate life-history pathway. Oecologia 166: 131-140. 2 Hicks A, Barbee NC, Swearer SE, Downes BJ. (2010). Estuarine geomorphology and low salinity requirement for fertilisation influence spawning site location in the diadromous fish, Galaxias maculatus. Marine and Freshwater Research 61: 1252-1258. 3 Mitchell CP, Eldon GA. (1991). How to locate and protect whitebait spawning grounds. Rotorua: Freshwater Fisheries Centre. 49pp. 4 Orchard S, Hickford M. (2016). Spatial effects of the Canterbury earthquakes on īnanga spawning habitat and implications for waterways management. Report prepared for IPENZ Rivers Group and Ngāi Tahu Research Centre Waterways Centre for Freshwater Management and Marine Ecology Research Group. Christchurch: University of Canterbury. 37pp.